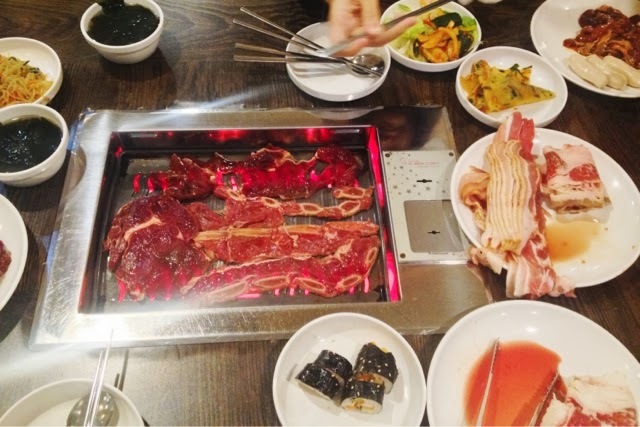 Ssikkek BBQ is a popular Korean BBQ buffet restaurant, a sister to the 2D1N Soju Bang. Since established in 2011, there are currently five outlets in Singapore: United Square Novena, Oriental Plaza Chinatown, Tampines1 Tampines, Bras Basah Complex, and Junction8 Woodlands. 1) It's buffet (guys like buffet). 2) It's relatively cheap ($24++ for weekend dinner), you pay almost the same if dining a la carte elsewhere. So we went to Ssikkek at Oriental Plaza. We were there at around 7.30pm, and there was a line, but not so bad. As soon as we were in the restaurant, we were seated on a table adjacent to the food bar. The restaurant was clean, well air conditioned, and gave a comfortable dining "feel" even though it's full - unlike other steamboat buffet restaurants that are nasty. Thumbs up for these. We started off by taking some Korean banchan / side dishes: kimchi, white pickled radish, jjapchae, pajyeon, kimbap, seaweed soup, kimchi stew; and also from the deep fried counter: mandoo and french fries with their special mayo dip (that reminded me of Washington Avenue Bahn Mi's french fries dip). The side dishes were pretty awesome. I love the seaweed soup cuz it's very comforting to the stomach, the mandoo, the fries and dip. The jjapchae and kimchi stew were pretty ok although I claim I cook better ones. The pajyeon was mediocre, and if you could, avoid the kimbap as they tasted weird. I shall move on to the most interesting part - the BBQ. 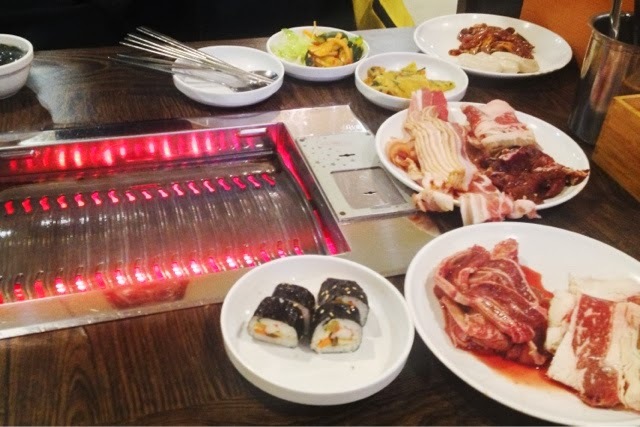 As for the BBQ meat, Ssikkek offers a huge variety: beef short ribs, beef ribeye, beef short tip, beef bulgogi, pork belly, bacon, pork bulgogi, pork loin, chicken bulgogi, mini sausages. There are also some seafood such as shrimp and squid. Not forgetting, they offer vegetables for grill such as enoki mushrooms. Also, they offer fresh vegetables and condiment used for wrapping the barbecued meat to be eaten in a traditional Korean way. For example, fresh bibb lettuce, garlic, jalapeno, green onions, dobanjang, gochujang, sesame oil, soy vinegar, etc. If all of these are not enough for you, they have free Korean instant cup noodles for you to eat to, but I doubt anyone would choose this option, wouldn't you? Not forget to mention, iced Korean tea, yellow colored beverage that tasted like Vitamin C drink, and sodas are offered. Ice cream sticks are available at $1 a stick. Grab the Melon, trust me! My dining experience at Ssikkek was very satisfying. Even though there is a time limit of 2 hours stay, to my surprise they do offer to change the grilling pan after charcoal has built up on it. For those of you with big appetite, this is definitely a place to go!